Two signs you’re at a great concert: First, the “official” press photogs are still hovering next to the stage well after their 3 song limit in the press pit has expired, without cameras in hand and actually singing along with the rest of us common folk. Second, and perhaps most indicative of the quirky yet totally entertaining night of live music—Martha Plimpton (yup, that blond chick from Goonies) is rocking out in front of you. Wouldn’t be Central Park SummerStage without some celeb name-dropping, now would it! Some of my friends—concert companions with similar musical tastes to mine—have recently come to love the Decemberists. They’ve crossed rivers and turnpikes, venturing from NYC to Jersey City just to see this Portland band—two nights in a row! Others say, very matter-of-factly, that they just don’t get what’s so great about them (The Decemberists, that is, not my friends ;-). Trusting the former, I hit up iTunes and downloaded the band’s newest release, The Crane Wife. Honestly, I can see how for some listeners the verdict is still out on this eccentric quintet. They’re indie for sure, so it’s hard to put a label on them…but of course, that’s the biggest reason to jump on their musical bandwagon. Get on board, people! Mixing more popular genres like folk-rock and pop with that of chamber music and Celtic beats, just to name a few, The Decemberists are a far cry from your typical mainstream band. Their eclectic yet melodically appealing sound is the perfect backdrop for Colin Meloy’s super literate, story-like lyrics (the teacher in me is thinking SAT vocab prep for my students) filled with whimsical tales of sea captains, mariners, murderers and lovers. 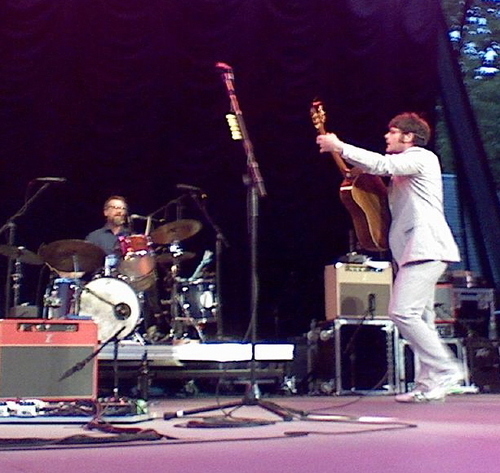 That being said, The Decemberists have managed to infuse enough pop fizz into their potpourri sound, not to mention huge stage presence (which we’ll get to later), to now sell out their own headlining shows—just 1 year ago, they were opening for Death Cab for Cutie at SummerStage. Seeing and hearing them live is definitely the best introduction to their unique sound and energy. Last night’s sold-out show proved that they’re not only meant for the stage, but that next summer they’ll probably need a bigger one on which to perform. Just like their sound, The Decemberists have a look that’s all their own. 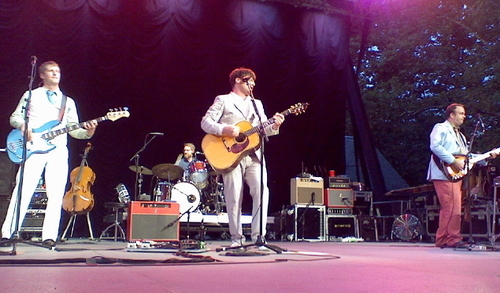 Clad in his thick-rimmed glasses, blue sear-sucker suit and Asics kicks, Colin Meloy is the most unlikely looking rocker front man. 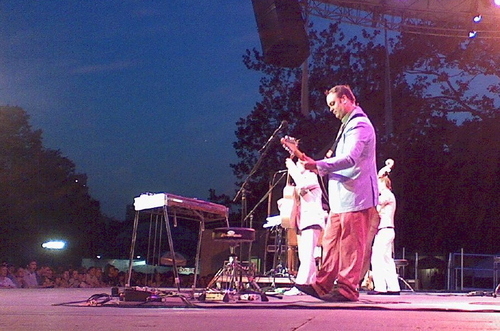 When his band mates filed on stage behind him, each equally adorned in suits, blazers and ties, I wondered if they had confused SummerStage for Shakespeare in the Park. 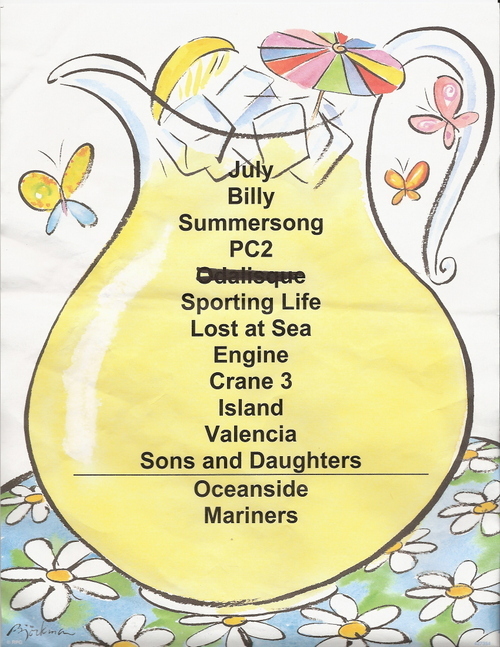 But alas, when the aptly titled opener “July, July” started, and the crowd went nuts, in a very not suitable for Shakespeare but totally appropriate for a concert kind of way, it was obvious they were at the right event. Though we didn’t have the privilege of hearing the band backed by an orchestra, as some lucky cities are, the show was solid and fun from start to finish. Meloy is a true entertainer and knows how to play into the crowd, jumping and dancing around and balancing on the edge of the stage as if to sing and play directly to the front rows. He’s definitely all about interacting with the crowd…and the fans eat up every bit of it. How can you not when you’re praised for being “well quaffed, well dressed and well perspired” on a humid July night in NYC!?! During “O, Valencia” he not once, but twice motioned for security to give him the oh so dangerous beach ball they had snatched from the fans…only to toss it around a bit on the stage and then kick it right back to the crowd. Meloy then very politely asked us to sing along on “Sons and Daughters,” if we didn’t mind of course, because he felt like he was more at a campfire than a concert. I love a band that can turn a rock show into a “Kum Ba Yah!” Needless to say, we obliged. After a round of thunderous applause, Meloy quickly returned to the stage for a solo version of “Red Right Ankle” (an impromptu addition to the official set list thanks to the band keeping their banter to a minimum and not yet exceeding their strict 10:30 curfew). His pitch perfect voice echoed through the park, only to be complemented mid-song by Jenny Conlee’s back-up vocals and organ acoustics. The band’s theatrical antics truly came to life at the end of the night, I believe during “The Chimbley Sweep” (also added to the set list) when each band member, one by one, stepped out of his/her assigned stage position and played slower and slower until obediently falling down to sleep under Meloy’s directive that “it was time for bed.” With that, came the best audience participation I’ve ever seen at a show… the entire audience also went down and even silenced when told to do so! A true testament of the command an entertainer can have over the fans before him. I’ll admit, I was busy getting a kick out of the scene before me, when Meloy spotted my group of upright cohorts and I at stage right and ran over, arms in the air, as if to scream…Why are you still standing?? Immediately, we dropped to the ground! Signaling everyone back up, the band echoed the cheers and excitement by closing the evening with a long, but amazing rendition of “The Mariner’s Revenge Song.” Great night in Central Park! The Decemberists are by far one of the most entertaining and charismatic acts I’ve seen in a while. i can't wait to see them this fall! thanks for the review. Another great review, Leslie! Decemberists rock! although they did do a brand new song to close the show, kinda different. Thanks for your great reporting. I am a huge fan and wish i was at the show. Thanks for "suggesting" i go. I was pleasantly surprised and you couldn't have described the show any better. yeah saw them in july - so much fun...their lyrics are total sat vocab! i even had to dictionary.com them..they have a great sound..! fun! 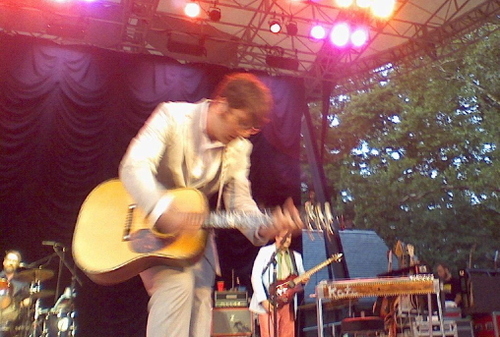 The Decemberists rock! Spent the winter listening to the Crane Wife cd. Great review. Thanks again. Great write-up, Leslie! Shows in Central Park are always fantastic! Sounds like you are lucking out with one great show after another! so I can see - hear them! Great review. Love reading your reviews. Wow and I thought Decemberists were people born in December:) Geez you teach me something new every concert. Great review and great pics Cuz. good entry, inspired me to recheck some of their stuff out. i'm off to summerstage tonight now, whoo! Wow sounds amazing. You are a great critic of the music - you know your stuff! Can't wait to read more and maybe see some shows myself! Did Martha Plimpton bring some rock and roll with her? was it some rocky road? Either way great celebrity sighting. Oh, and it sounded like a good show too. I hadn't heard of this band, but after reading Leslie article, will be downloading soon! Thanks for another great account of what sounded like a wonderful night in NY ! Given that I know more about the early 19th century politcal movement from which the group's name is inspired, I think I'm more intetersted in how you might translate this into a SAT vocabulary prep experience. Great review -- got me to listen on line. Even impressed my hipster son. What's next in this fantasy tour of yours? Sounds like you are having a fun-filled summer! Never heard of these dudes, but the "Kum Ba Yah" sounds more like my speed. I'm ready to lite one up and hug everyone. Your descriptive story telling brings me up close and personal to the event itself. Never heard of the Decemberists, but as always you wet my appetite and arouse my senses. What a scene it must have been with everyone down on the ground. Sensational review, once again!!! What an amazing review! Good job Leslie! Makes me want to find out if the Decemberists will be coming to the Great White North anytime soon. I have not one single clue who the Decemberists are, but December is a great month for our family, so I'll assume this group is the living end. You make everything sound thrilling. Keep up the great wotk.